Throughout the years, Jax Woodworkers Club has been honored to receive recognition in our local paper. Below are some of those articles for your review. Just click on the date to review. A pediatric program of Community Hospice. Community PedsCare® is a national-award-winning* pediatric palliative and hospice program for children with life-limiting and life-threatening conditions. A program of Community Hospice of Northeast Florida in collaboration with Wolfson Children’s Hospital, Nemours Children’s Clinic and the University of Florida — Jacksonville, Community PedsCare offers support, comfort and care to these children and their families. Click on Image to see thank you note. Family, Career and Community Leaders of America is a dynamic and effective student organization that helps young men and women become leaders and and address important personal, family, work and societal issues through family and consumer sciences education. Chapter projects focus on a variety of youth concerns, including teen pregnancy; parenting; family relationships; substance abuse; peer pressure; environment; nutrition and fitness; teen violence; and career exploration. Involvement in FCCLA offers members the opportunity to expand their leadership potential and develop skills for life planning, goal setting, problem solving, decision making, and interpersonal communication necessary in the home place. Methodist Children's Village opened in 1974 as a mission of the United Methodist Church and continues to serve children from birth to 5 years, irrespective of income, race or religion. The Center was established in 1974 for the purpose of providing child care and other family related services for children birth to twelve years. This facility is considered to be in compliance with Title VI Civil Rights Act, Section 504 Rehabilitation Act, Title IX Education Amendments. Our ethics and integrity reflect the highest professional child care standards and our commitment to Judeao-Christian family values. As a mission of the church we offer our resources in meeting needs of families. No need is too small to be important or too great to be met. Priority enrollment is given to children and families in crisis. Kids Wish Network has been making dreams come true for hundreds of thousands of children all over the world since 1997. We are dedicated to infusing hope, creating happy memories, and improving the quality of life for children who are experiencing life-altering situations. Our dedication and commitment to our children is what drives us to continue to grow and expand. It is our promise to continue to bring much-needed joy to these brave young hearts through our unique programs and services and bring them the hope and comfort they truly deserve. The Florida Bluebird Society’s mission is the conservation and protection of Bluebirds and other federally protected cavity nesting bird species in North America. This is accomplished through educational programs and the collection and dissemination of pertinent and relevant information. The conservation and protection of bluebirds and other federally protected cavity nesting bird species in North America through educational programs and the collection and dissemination of pertinent and relevant information. Whether it’s the giant crayons framing the main entrance, the playful murals or the brightly colored boats and wagons that carry children through the hospital, it’s evident from the moment you set foot inside Wolfson Children’s Hospital that we are focused on the unique needs of children. At the region’s only children’s hospital, skilled pediatric specialists, advanced technology and evidence-based practices help children overcome illnesses like serious heart conditions, brain tumors and diabetes. By partnering with 10 Blacksburg schools, Micah’s Backpack provides direct food assistance for children from low-income families. Every Friday during the school year, the identified students receive a backpack filled with two breakfasts, two lunches, two dinners, snacks, juice and milk boxes, and an educational piece. On Thursday evenings up to 100 volunteers from various academic, civic, and interfaith groups volunteer together with staff building community while packing the backpacks. On Friday mornings volunteers deliver the bags and the partner schools distribute to the students. Currently, 280 children in Blacksburg schools receive a gift of healthy food during the academic year and approximately 140 during the summer school break. By feeding this vulnerable population we demonstrate that their community cares about them. We are Northeast Florida’s largest provider of comprehensive services for homeless men, women and children. We are one of only a few centers in the nation to offer a full range of services for the homeless 24 hours a day, 7 days a week, 365 days a year. BEAM is a community based organization serving low income residents in Jacksonville’s beaches communities and relying heavily on community support to assist our neighbors in time of need. We envision a future in which no beaches resident goes hungry or is haunted by the fear of eviction. ​Click on image to see thank you note. Our Mission: to empower all people with a disability to live independent, self-empowered lives. The ILRC has empowered the northeast Florida disability community, since 1978. Our agency is part of a national network of over 400 Centers for Independent Living. The ILRC is consumer driven and flexes to the needs of people with disabilities living in our community. Each person with a disability has unique goals for independence. Our staff empower each person to achieve their goals by developing and monitoring individualized Independent Living Plans. Programs include advocacy, benefits screenings, education, employment, equipment loan, information and referral, independent living skills training, peer mentoring, and sign language interpretation. HISTORY * Methodist Children's Village opened in 1974 as a mission of the United Methodist Church and continues to serve children from birth to 5 years, irrespective of income, race or religion. The Center operates as a not-for-profit 501(c)(3) organization; contributions are tax deductible as allowed by law. ​MISSION * Methodist Children's Village has one agenda: EXCELLENCE! I) Enhancing the quality of young children's lives through nurturing, early intervention, and developmentally-based education. 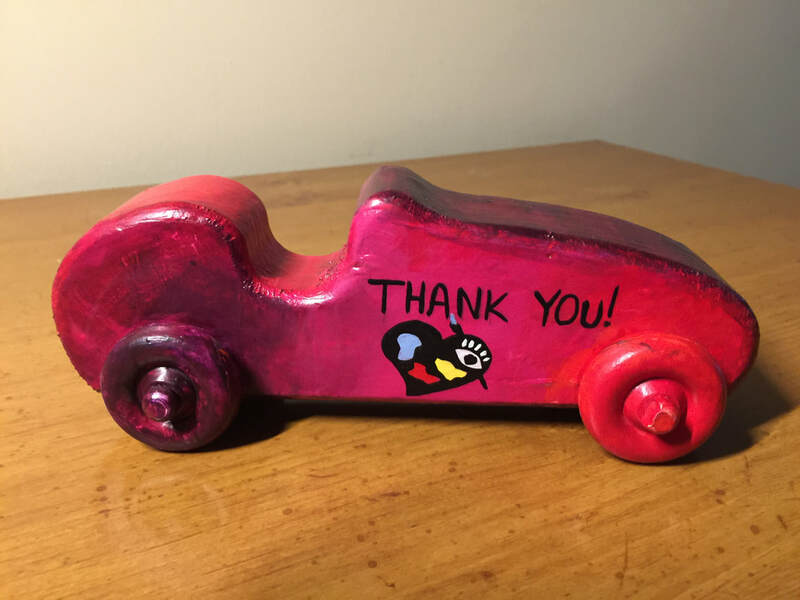 Art with a Heart uses toys made by Jax Wooodworkers Club to help patients. Art with a Heart in Healthcare provides personalized fine art experiences that enhance the healing process for patients and their families. Art with a Heart artists, volunteers and UNF interns create individualized art sessions that meet the needs of patients, at their bedsides and in groups. Our team of artists have served tens of thousands of patients and their families in Jacksonville Florida at Wolfson Children's Hospital, Nemours Children's Speciality Clinic, and Brooks Rehabilitation Hospital. Resurrection Episcopal Church is a Christian community Church dedicated to serving God and all creation. We foster spiritual growth through worship, prayer, education, service, stewardship and celebration. As a parish in a thriving and changing community we seek to welcome and nurture all who wish to share our journey. Come Join us Sunday Mornings at 10:30 AM.